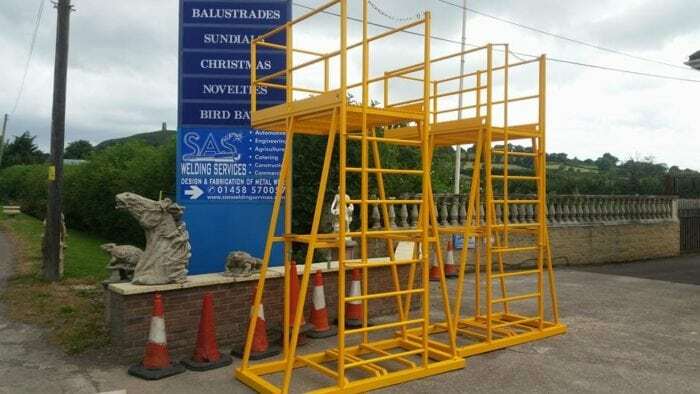 SAS made these two mobile operators platforms for a customer from Wells, Somerset. These were fabricated to the customers drawings and specifications. Due to new health and safety regulations these had to be manufactured to allow machine use. The platforms were fabricated and painted in our workshop in Glastonbury, Somerset. They were then loaded and sent straight to the site ready to be used. SAS Welding Services are the business to call for your fabrication and manufacturing needs in Somerset and the south west. We can undertake repetitive jobs both small or big in our fully equipped workshop. Feel free to contact us to discuss your fabrication and welding requirements.